The Wistar Institute and the Philadelphia Zoo employ different preventative approaches to improve the health of humans and animals around the world. The Zoo uses conservation and education while Wistar uses biomedical research in vaccines and infectious disease to achieve the One Health goal set by the Center for Disease Control. The Wistar Institute and the Philadelphia Zoo, two esteemed organizations with a long history in Philadelphia — the first independent research institute and the first zoo in the country, showcased a partnership to advance the global message of “One Health” throughout the region in an event held at the Zoo. One Health is a collaborative, multisectoral and transdisciplinary approach operating at the local, regional, national, and global levels with the goal of improving the lives of people and animals through the collaboration of human medicine, research and conservation science, among other fields of study. 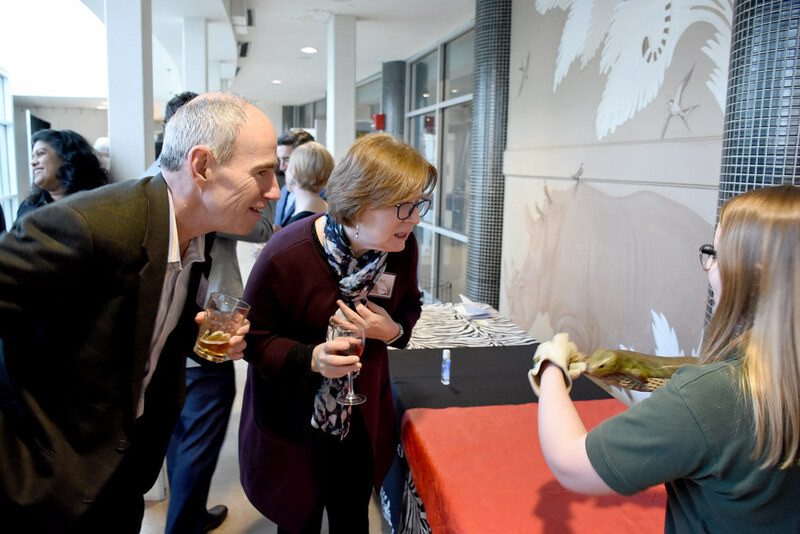 Immersed in the atmosphere of the Zoo’s Small Mammal House, the guests heard about the intrinsic link between the health of people and animals and how Wistar and the Philadelphia Zoo enact the One Health approach. Michael Stern, Philadelphia Zoo curator of primates and small mammals, presented a successful international conservation initiative of the Zoo to preserve the Rodrigues Fruit Bat, a story that perfectly encapsulates the Zoo’s vision of a future in which people and animals thrive together recognizing that what is good for wildlife can also be good for people. Rodrigues is a small island located 900 miles east of Madagascar. At the time of its discovery, it was a hotbed of biodiversity with many endemic plant and vertebrate species. Less than 200 years after human colonization, the majority of these species were lost or threatened, and this paradise turned into barren land. By the 1970s, less than 100 Rodrigues Fruit Bats had remained on the island and they had officially become the rarest bat species in the world. The staff from the Philadelphia Zoo began conservation efforts in Rodrigues in 1995. Leveraging the Zoo’s consistent engagement and financial support, the Mauritian Wildlife Foundation that has taken over the project has obtained funding to grow the conservation program, which now includes reforestation efforts, community engagement, planting native seedlings to create more roosts and food for the bats and other species. The local government fully supports the work and has even started subsidizing cooking gas to reduce the need for deforestation for cooking fuel. As a result, forests and the bat population rebounded and by 2013 had reached almost 20,000 individuals. In 2017, the Rodrigues Fruit Bat was down listed from “critically endangered” to “endangered” and other species on the island have been down listed too. David B. Weiner, Ph.D., the W.W. Smith Charitable Trust Professor in Cancer Research, Wistar executive vice president and director of the Vaccine & Immunotherapy Center, provided a perspective on zoonotic diseases, which are caused by infections that spread between animals and people, and the interconnectedness of animals, people and their shared environment. He spoke to past and current biomedical research contributions that Wistar has made to the health of people and animals, including vaccines against rabies for people and wildlife that have helped to make rabies-related human death a rarity in the U.S. and many other countries. Often the animals are primary hosts for zoonotic viruses and do not get sick from them, but they can pass it on to other species and to people. We humans can also infect animals with our diseases. Examples of zoonotic diseases are Zika, Ebola, SARS, Nipah, MERS, influenza, and rabies, all of which are research areas at Wistar. Zoonotic diseases are a major global health concern today: the human population is continuously expanding to new areas and humans are coming in close contact with wild animals that can carry diseases; climate change is modifying environmental conditions and habitats creating more opportunities for diseases to pass to animals; international travel and trade facilitate the fast spread of disease across the globe. Finally, we, as a population, have changed too: now there are many immunocompromised individuals living throughout the world, such as cancer survivors and organ transplant recipients, and we live longer so our immune system gets weaker as we age. Wistar is now tackling many infectious diseases with next generation synthetic DNA vaccines, which are different from traditional vaccines in that they don’t contain viruses and are faster to develop, having the potential to provide adequate response to fast-emerging outbreaks. Wistar scientists have taken this approach to the clinic and shown that DNA vaccines are safe and able to produce robust immune responses. They are currently developing DNA vaccines for Ebola, MERS and Zika that have gone from preclinical to human studies in just months. Wistar and the Philadelphia Zoo look forward to working together in the future to continue to keep animals and people healthy.